For those of you who read my review of “Children Make Terrible Pets,” you know how much I adore author and illustrator Peter Brown. That title was, hands down, my favorite find of 2010. I reviewed it as my top pick from last year’s New York Times Best Illustrated list, and I gifted it to more children than I can count. It also won major chuckles from 16 four and five year olds when I read it aloud at my daughter’s preschool last month – and is there a better review than that? 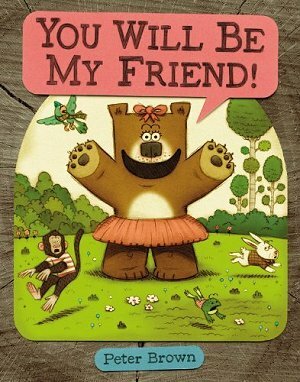 This time around, Lucy Bear is bound and determined to make a new friend. However, her overly eager approach only earns the disdain and annoyance of the other forest inhabitants. 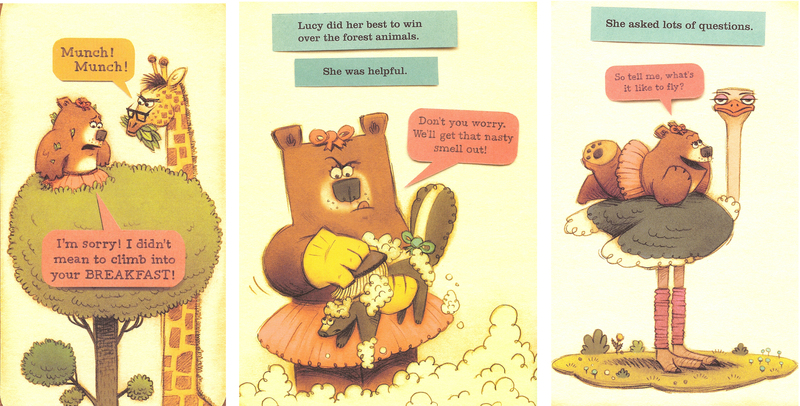 Consistent with the bear we came to know and love, Lucy deals with her frustration in the only way she knows how: a MAJOR tantrum. But just when she’s given up, a perfectly suited friend finds Lucy. 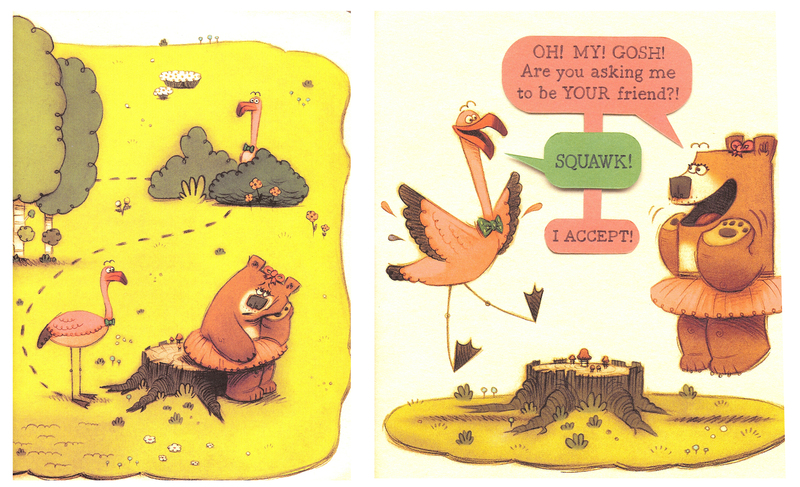 Lucy’s plight is a humorous presentation of the discomfort most of us experience as we struggle to make new friends. I can remember with clarity the way it felt to be excluded from playground cliques and exclusive birthday parties in elementary school. I was a bit of a bookworm and had a “unique” sense of fashion. Thankfully, I had parents who never pressured me to fit in, and, just like Lucy, I eventually found friends who loved me, Anne of Green Gables obsession and all. 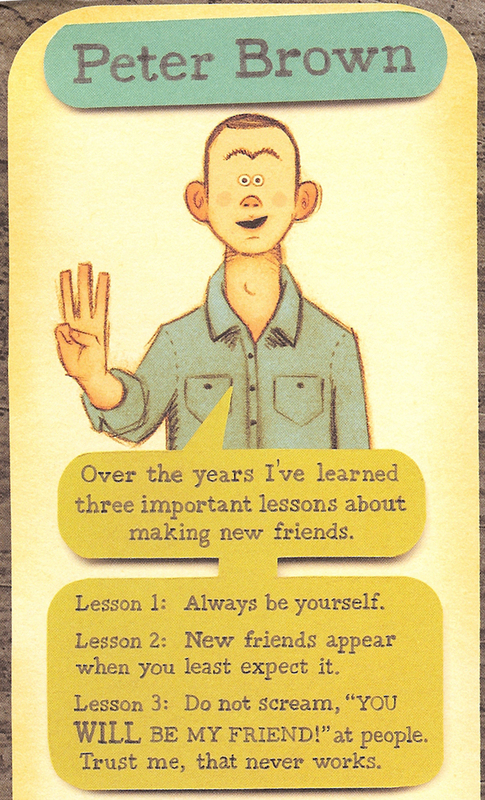 The funny thing is, the anxieties of making friends haven’t seemed to wane much in adulthood. The few very close friends I’ve come to count on over the years have found their ways to other cities, states and countries. Back in my hometown, now in the role of newly-minted Stay-at-Home Mom, I felt about as confident as a seventh-grader on the first day of school when I walked into my first Kindermusik class with six-month-old Eloise. Would any of the other mothers like me? Are they all going to wonder why I can’t get this colicky baby to stop crying? Most importantly, would anyone ask us to play? Motherhood can be lonely. I may not have adored my coworkers in my previous life in the workforce, but, like most stay-at-home moms, I had come to realize how much I missed regular adult interactions, completed in full sentences. I don’t know if the Starbuck’s drive-thru-window attendants realized home much I had come to depend on their routine niceties. While Brill still finds herself searching, I’ve miraculously managed over the past three years to find an wonderful group of “mommy friends,” many of whom I met in that first music class. These women give my life a fullness, without which I think I would have lost my mind long ago. There are the playdates, of course, but they also provide an invaluable sounding board as I navigate the everyday challenges of parenting. And among them, I’ve found a wicked sense of humor, amazing creativity and friendship that surpasses our shared roles as mothers. That’s not to say I don’t still worry that they might think I’m a poor housekeeper, that my kids are out of control or that I talk too much. And trading numbers and arranging first playdates with new acquaintances is still about as nerve-racking as asking a boy to the high school homecoming dance. But I can only hope these women are as grateful for our fledgling relationships as I am. However, there will always be those – like my younger sister, Allison, or my good friend, Annie – who seem to draw friends like a magnet. Our youngest, Charlotte, hints at having the sort of charisma that will “win friends and influence people.” But three-year-old Eloise is of her mother’s mold. It came as no surprise to learn at her fall conference that social skills were not her strong point. It seems she prefers a book to a playmate. 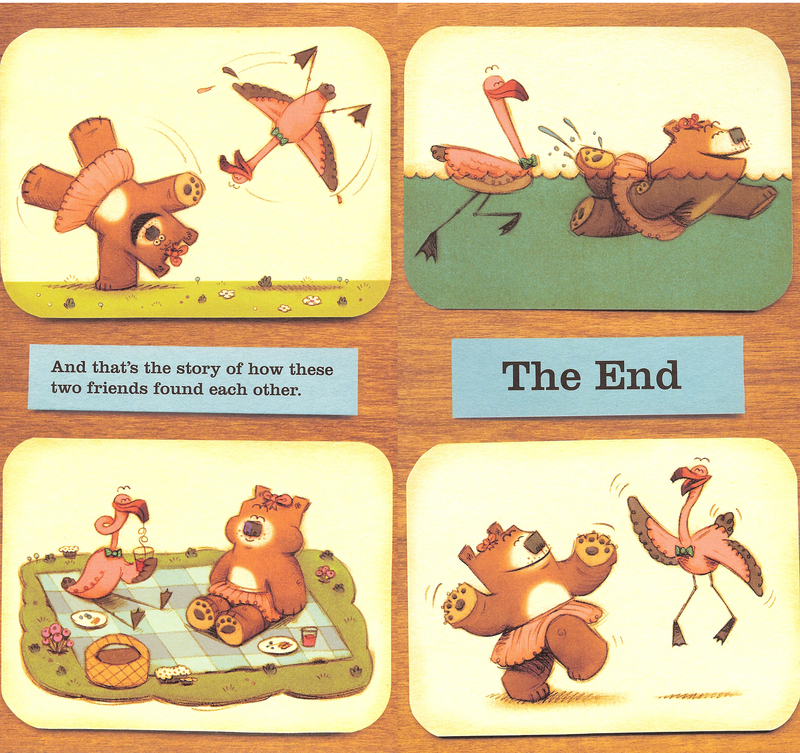 Regardless, l’ll take author Peter Brown’s approach: always encourage Eloise to be herself and have confidence that friendship will find her, just as it did for me.